Leave your mark on dividers and keep documents organized and up-to-date. Mini Durable Write-On dividers feature five stylish colourful tabs and plenty of room for you to label each divider for reference. The small size is perfect for dividing small binders or planners. Leave your mark on dividers and keep documents organized and up-to-date. Mini Durable Write-On dividers feature five stylish colourful tabs and plenty of room for you to label each divider for reference. The small size is perfect for dividing small binders or planners. 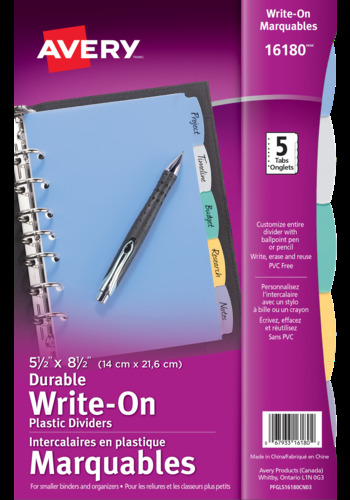 Write on the durable translucent plastic tabs with a ballpoint pen or pencil for colourful organization. Customize dividers easily and simply erase previous labels to reuse dividers and update binders. Write-On Dividers are perfect for when you want to keep up with organization but want the freedom to make changes and update documents. Create the perfect portable companion to hold all your big ideas with Mini Binders and Accessories.